If the world fell apart overnight, what would you do to protect your family? When a horrific natural disaster causes the collapse of civilisation and strands Cody Ryan deep inside the Arctic Circle, he is forced to embark upon an impossible journey. Thousands of miles from home in a brutal new world where only the strongest will survive, Cody and his companions must conquer seemingly insurmountable odds in a search for their loved ones, the limits of their own humanity and the rumoured last refuge of mankind… Eden. I’ve mentioned on the podcast a few times that I grew up reading Michael Crichton’s works; mixtures of thriller and scientific exploration that asks questions the world around us. Big ideas are explored in an easy to understand manner alongside thrilling action set pieces. Who wasn’t thrilled by Jurassic Park while understanding DNA sequencing in dinosaurs? So since his sad passing away, I’ve been looking for books in a similar vein to entertain and educate me. The book begins in the Arctic Circle with a group of scientists situated near an Army base but in reality taking part in an experiment to see how they would interact on a mission to Mars. The group have been selected to provide a clash of personalities so when things go wrong you know that clashes will occur with dangerous consequences. Straight away you also feel the cold and claustrophobia as the snow and ice creep in around you. It left me with a yearning to watch John Carpenter’s The Thing, about a group in a desperate and dangerous situation out on the ice. From the outset, amongst our group of scientists we are not meant to trust our protagonist Cody as there are dark hints towards an event in his past. Why did he take up this position on such short notice, leaving his wife and daughter behind? Slowly this violent moment is revealed and, while I felt his actions were a little unbelievable towards the end, he is someone who you not only root for but grow to like over time. Cody is desperate to return home to find his family and in doing so his morals and beliefs are tested at every turn as the journey continues. With its Arctic beginnings, I was a little surprised when the book switches and takes on a much bigger scale. I’d imagined an icy and dangerous journey home, hoping for rescue, but soon the book takes on a twist aboard the ocean. Very quickly a new and dangerous group of characters are introduced with deadly consequences. 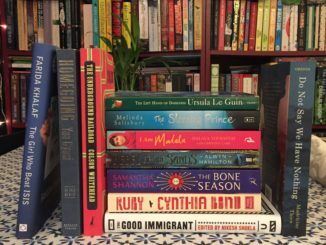 The novel is also interspersed with diary entries – these help mark the passage of time and it has to be said that the book covers a far longer period of time than I expected. While the diaries entries were an interesting technique to get the characters themselves to comment on events and share their inner thoughts, there were moments when I’d have rather seen the events mentioned rather than just being told about them in diary form. Eden makes some interesting points on the Western world’s reliance on electricity and technology, portraying a rather horrifying picture of a world on the edge of collapse. Crawford explains the ‘science bits’ in a clear and straightforward manner and the speed of the collapse, as nuclear power plants fail and clean water becomes scarce, leaves the reader with a dark vision of the future. Yet it was one passing remark from a character about those living in Third World countries, with little electricity or electrical items and how their situation would suddenly be much different to the West, that I’d have liked to have been explored further. Eden is a dark and sometime disturbing thriller thats clearly been well researched and offers us a frightening glimpse into the future. There were momentary lapses where credulity was stretched a little thin and some of the dialogue felt stilted but it moves along at a brisk and entertaining pace. As a lifelong fan of Michael Crichton it never quite reaches his level but as a book that explores ideas, it is one that mixes thrills with a much bigger questions. 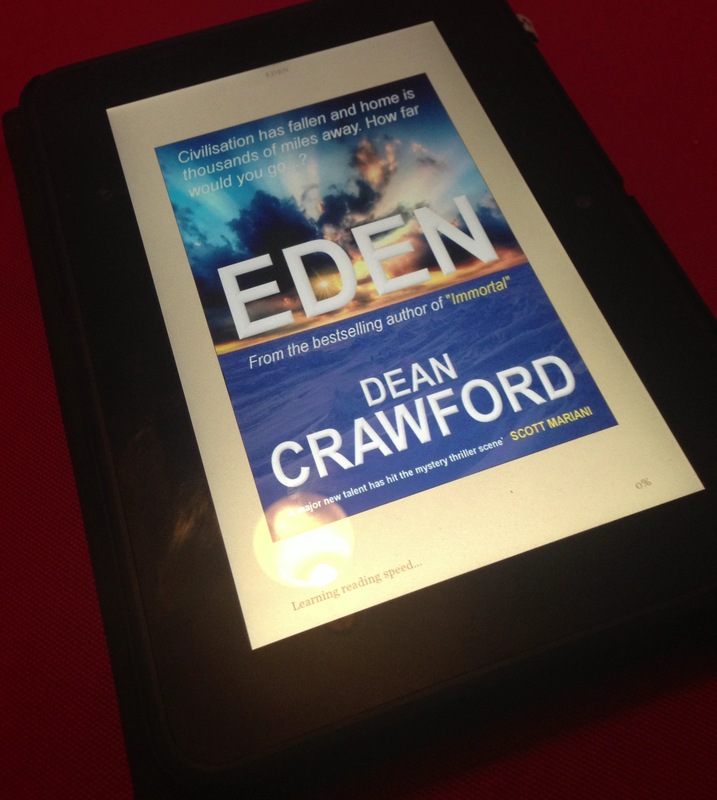 Eden by Dean Crawford is available to buy now on Kindle.